The Mesh Discovery D2400 WLT (£799 inc. VAT) features a generous specification, and could be the answer for those seeking a good all-rounder for a budget price. The 15-inch TFT screen is sharp, and offers plenty of room for multiple windows. It has a 4:3 aspect ratio, which is useful, but not ideal for DVDs. Mesh has opted for an integrated graphics solution - Intel's 945GM, which uses up to 128MB of system memory. This is suitable for office tasks, browsing the Internet, and playing DVDs. The machine's shape allows for a large palm rest. Although the keys are of a good size, we found them unresponsive, and the keyboard fl exes under pressure. The chassis is robust, however, making this a laptop you could use every day. Unfortunately, the touchpad sits near to the keyboard, making it easy to move text accidentally as you type. Powered by an Intel Core Duo T2400, backed by 1024MB of DDR2 memory, we found the Mesh to be an average performer, achieving a score of 201 in our MobileMark 2005 benchmark. Although it couldn't offer the quick responses of other machines, it has suitable performance for everyday use. We recorded a battery life of 193 minutes, under test conditions. The Discovery is well-specified. Users can connect to both wireless and fixed networks, thanks to an 802.11a/b/g Wi-Fi adapter, and Gigabit Ethernet. 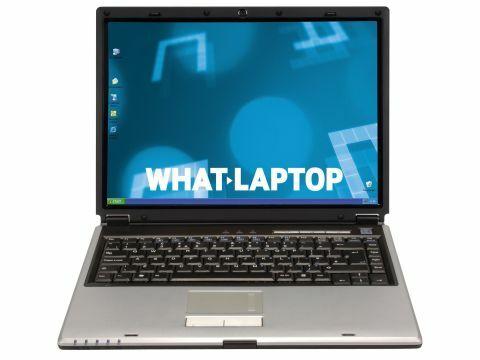 S-Video and VGA-out ports enable external displays to be connected, and a Sony dual-format DVD rewriter and 3-in-1 card reader lets you back up files. Although it represents good value for money, the Discovery D2400 loses much of its appeal due to the poor keyboard.